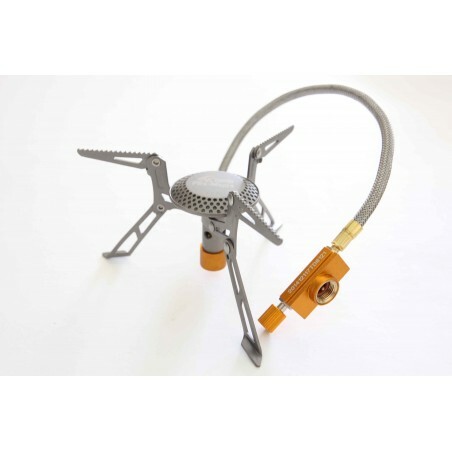 Fire Maple Titanium Folding Micro Stove FMS-117T. Great for outdoors activities like camping, hiking and backpacking. The Fire Maple FMS-117T Stove was designed for trekking, camping, hiking, backpacking and climbing. Its main titanium construction gives a combination of super lightweight, high strength and anti corrosion capability. Comes with small carry bag. Compact size, Open 144.6 mm x 74.6 mm. Lightweight at 98g. Power:2800W. The stove uses a standard isobutane/propane mix canister you can pick up at local outdoor store. Butane fuel can is not included.